The beautiful desert communities in Southern Gila and Eastern Pinal Counties have relied on an economic base of copper mining for well over a century. Dubbed as the “Copper Communities,” this region has been benefited and challenged by the successful industry. Recently the slowdown of copper mining and production has had a significant impact on the region. The poverty rate for families in the region is 5.2% higher than the national average. The poverty rate for individuals is 6.8% higher in the region than the national average. In some areas the poverty rate for individuals is as much as 18.4% higher than the national average (Claypool, AZ). In an effort to diversify the region’s economy and lessen the economic impacts of the boom-bust mining cycles, the Southern Gila County Economic Development Corporation (SGCEDC) and the Copper Corridor Economic Development Council (CCEDC) are working together to identify economic opportunities in the region. Two of the region’s most valuable assets, other than copper, are climate and location. The region enjoys the mildest climate in the state with summer temperatures as much as 15 degrees cooler than the desert floor of the Phoenix metropolitan area and 20 degrees warmer than the winter temperatures of the high desert, mountainous plateau. The region is also located in the center of the state with US Hwy 60 as a main artery and the Eastern Arizona Railway running through the region. These factors demonstrate the need to explore and address the opportunities of agriculture and expansion of the local food economy. To this effort, the SGCEDC received funding from the USDA to conduct a feasibility study related to the viability and placement of a Food Hub, along with the creation of a business plan and recommendations for the appropriate organizational structures that would best suit the region. Local First Arizona Foundation is excited to be providing support throughout this process of economic diversification. 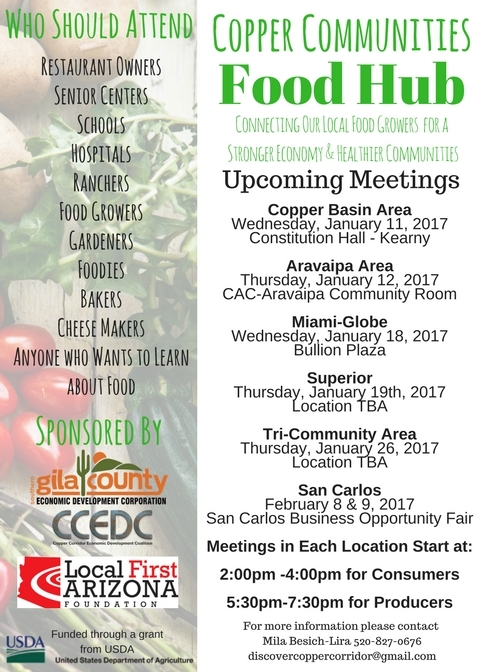 All those who live within the Copper Communities as consumers, and all current and potential food producers are invited to join in this exciting process over the coming months. For the first phase of the feasibility study, we are hosting a series of community meetings and conducting surveys of food producers (including farmers, ranchers, and folks producing value-added products like wine and jams) and consumers (a.k.a. anyone who eats!). This community input is necessary to shed light on the supply and consumption of the local foods market in the Copper Corridor Region. 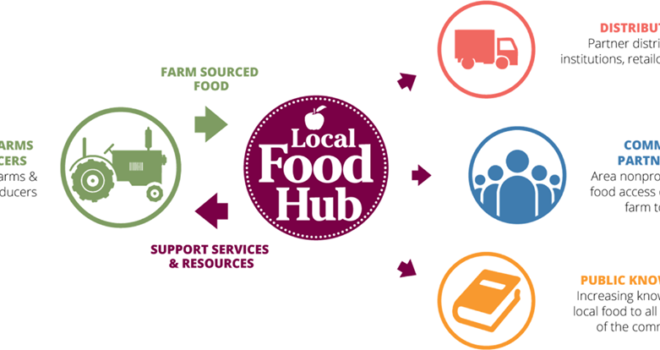 The information provided in the surveys and meetings will be compiled to determine a feasible model and location for the food hub. The anticipated benefits of this study will be the improvement of production, processing, storage, and distribution inefficiencies for conventionally or organically grown specialty crops. This will in turn strengthen the local economy, provide employment opportunities, and increase access to locally grown, fresh foods for all.